"The best thing about my time at City is the wonderful friends I made - they gave me the confidence to do things I'd never had the guts to do." 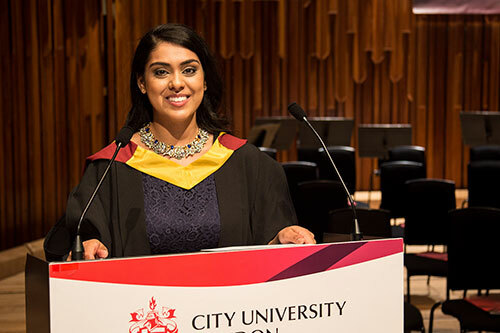 When I was chosen to be a student speaker, I felt humbled and honoured to have been given such a great opportunity to deliver a speech on behalf of Optometry. It was a surreal experience and I enjoyed every moment on that stage. What was one of the best things about City? One of the best things about my time at City is the wonderful friends I made. They gave me the confidence to do things that I thought I would never have the guts to do, this includes doing a skydive earlier this year to raise money for the Royal National Institute of the Blind. I will be diving straight into my pre-registration year as an optometrist. From what I hear it is going to be a tough and gruelling year ahead but I feel confident in knowing that I have been taught by some of the world’s best lecturers and am well-equipped entering the next stage of my career.